It feels as though the Thunder will eventually sort out their issues, but for now they are 8-12 and Carmelo Anthony is off giving quavering interviews about anger. Meanwhile, New York might be permitted to believe that it won a trade for once. Aside from any addition by subtraction by handing the keys to the offense to Krisaps Porzingis, Doug McDermott has contributed a little spurt of efficient offense—shooting 48.5 percent from the floor and 41.1 percent from three—while defending better than his reputation would suggest. And Enes Kanter, well, Enes Kanter has surpassed very humble expectations. 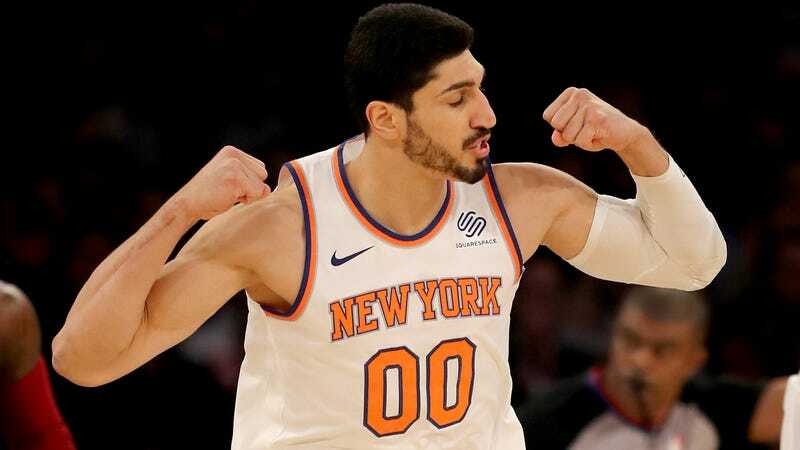 Coming in, Kanter seemed like a good candidate for tank commander—the turnstile at the center of what could have been a catastrophic defense, and has instead ended up being just the regular old 17th-best defense in the NBA. Posting the first non-negative defensive box-plus-minus of his career, 0.8, and roughly passing the eye test on defensive effort, especially on help. He is not the one-man liability he was in seasons past, literally unplayable in the playoffs. Shooting the lights out. His true-shooting of 68.0 percent puts him third in the NBA. His effective field goal percentage of 64.3 percent puts him fourth. Within three feet of the hoop he’s been cleaning up at 72.8 percent clip. All that nifty footwork is paying off. Cleaning the offensive glass with his usual gusto. His offensive rebounding is 17.3 percent, tops in the league, and it bears mentioning that he’s often jockeying for the same rebounds as a 7-foot-3 human. OK, that’s all there is to say. Let’s check in in May and see if Enes Kanter is still doing any of these things.